A local organization of performing artists has accused Norwegian Broadcasting (NRK) of exploiting the singers, dancers and musicians who compete in the annual Eurovision Song Contest, which NRK mounts locally every year. Kjetil Mørland and Debrah Scarlett are the latest to represent Norway after winning NRK’s preliminaries earlier this spring. 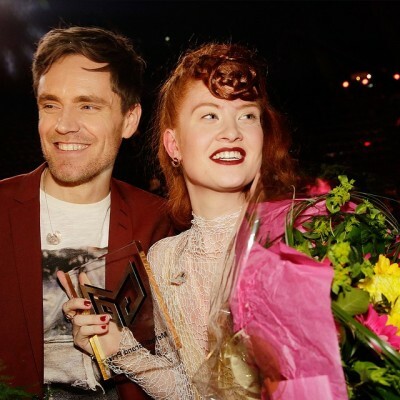 They call themselves simply Mørland & Debrah Scarlett, and their song, A monster like me, was considered a strong candidate to make it into the finals at Eurovision this weekend. As they prepared to take the stage at the second of two semi-finals in Vienna Thursday night, though, they were being all but pitied in Norway for not getting more advance publicity and for not being paid. In Sweden, reported Aftenposten, those taking part in what the Swedes call Melodifestivalen receive payment of up to the equivalent of NOK 30,000. Aafløy called it “illogical” that artists in Norway, “who actually make up the show,” don’t receive what the Norwegians call an honorar, or fee for services rendered. The contracts signed by artists performing in the Eurovision preliminaries state that NRK covers the costs of costume design and production, staging, choreography, travel, meals and lodging. No additional fee is offered for actual participation in either Melodi Grand Prix or, if they win, in the Eurovision song contest itself. NRK counters that the artists are compensated in terms of exposure on national, perhaps even international, prime-time TV, and that their song gets played on the radio. Aafløy claims that’s misleading, because only the winning song got much airplay this year and even that was little in comparison to earlier years. That vindicates NRK officials, who said they opted to use music firm HES to market this year’s finalists. They received much less media attention or radio air time than those in the past, though, with statistics from media research firm Retriever showing that Mørland & Debrah Scarlett only got 491 media mentions during the run-up to Eurovision, compared to 2,306 for the winner in 2011, Stella Mwangi, 1,865 for Tooji Keshtkar in 2012, 1,821 for the 2013 winner Margaret Berger and 1,855 for Thorbjørnsen last year. Interest reportedly was nonetheless high in Mørland & Debrah Scarlett heading into Thursday’s semi-final, despite the relative lack of advance publicity. They were hosted at a reception at the Austrian Embassy earlier this month, since Austria won Eurovision last year and is thus hosting this year’s show. Switzerland’s ambassador Rudolf Werner Knoblauch also attended, because Debrah Scarlett was born in Switzerland and studied in Basel after growing up in Norway. Mørland was proud to report at the reception that their song had been downloaded more than a million times on Spotify. The couple haven’t had a record company backing them up, nor have they had the resources for a lot of self-promotion. They were both thrilled, though, to perform at a pre-competition event Sunday in the elegant and historic Wiener Staatsoper and were excited about the final. “We’ve had a lot attention since we arrived in Vienna,” Mørland said on Wednesday, with Scarlett adding that interest seemed especially strong from German, Spanish and the Swiss media. The Eurovision Song Contest was due to be broadcast live from Vienna Thursday evening on NRK1 from 9pm.